One of the biggest movie stars on the planet returns to theaters this summer. And by biggest, we mean in terms of physical size. Everyone’s favorite kaiju creature will be back in the eponymously titled Godzilla: King of the Monsters, which is a sequel to the 2014 Godzilla reboot and the third installment of the franchise that also includes 2017's Kong: Skull Island. This time, Godzilla is not alone. The king of the monsters will be joined on screen by a few of his most iconic co-stars from past movies, namely the creatures called Mothra, Rodan and King Ghidorah. There will also be some human characters in this one, too, including those played by Millie Bobby Brown, Vera Famiga, Kyle Chandler and O’Shea Jackson. We visited the Atlanta set of Godzilla: King of the Monsters back in the summer of 2017 and learned quite a bit about the follow-up, and we’re now ready to share ahead of its May 31 release. 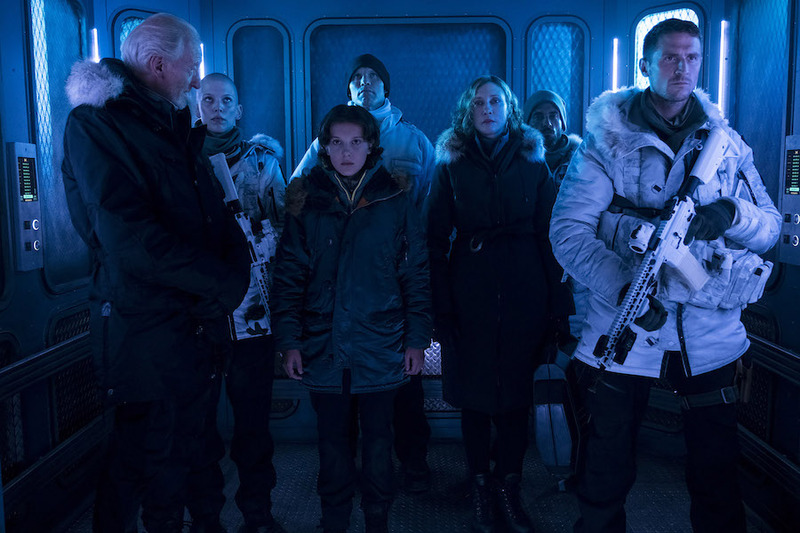 Below is a list of need-to-know information on the sequel, courtesy of Chandler, Jackson and co-writer/director Michael Dougherty as well as our own observations. He may be the king of the monsters, and he might step on a few homes on his way to battle other creatures, but there’s no mistaking Godzilla for a threat to mankind or otherwise an enemy of the people of Earth. He’s the hero that we need, a protector of the planet against even more destructive entities like Mothra, Rodan, and especially King Ghidorah. While Godzilla is the main hero of his own movies, on the human side of the story, the characters with the most significance and honor as superstars of this story are the scientists. Sure, the title character is big and mighty and has atomic breath, but there’s still a place for people to have a part in saving the world, with their brains. The previous installment of the MonsterVerse franchise, Kong: Skull Island, is a prequel set in the 1970s. Godzilla: King of the Monsters returns the action to the present, by which we mean this very year. Even though it’s been five years since the release of the last Godzilla movie, the sequel is not set directly after the events of the original. Of course, while the action takes place now, there’s a lot of back story informing what we’re seeing in the present. “That’s something we’re also trying to bring to this film for a more mythological, almost biblical, backdrop to the creatures,” Dougherty added, regarding the history of the monsters. “These creatures were once worshipped by some ancient civilization. I really love that about the old movies that Mothra was this deity. It really opened up the mythology." The 2014 Godzilla grossed more than $500 million worldwide while offering a rather slow-burn reveal of the titular monster and the extent of his powers. For the sequel, Dougherty and company had to not just go bigger in terms of looping in additional creatures and with the scope of the story but also to put more of a spotlight on Godzilla as the centerpiece of the action. When tasked with a modern-day reinterpretation of movies that go back more than 60 years, there’s definitely a desire by some people to change a lot of the elements of even the most recognizably iconic figures. But Dougherty assured us that his movie wanted to cater enough to fans of the old Godzilla movies in terms of the creature designs. “To me, it’s really important that the silhouette of the creatures are the originals,” he said. “Like, that’s always the basis of any good creature design, is the silhouette. You need to be able to look at the silhouette of the monster, whether it’s the alien (from Alien), Godzilla or whatever and be able to identify it. So we started with silhouettes. Just to make sure we get their very distinct shapes. In addition to the fictional creatures dominating the screen in the Godzilla sequel, there’s one more iconic monster featured in the movie. And fans from Boston might not appreciate this one — or maybe they’ll get a big kick out of it. That’s right, the “Green Monster” from Fenway Park, home of the Red Sox, shows up. The destruction of the stadium can be briefly glimpsed in trailers for the movie, but we got to walk among its ruins and see some concept art focused on the famous left-field wall. It’s a nice touch. Actually, love might not even be a strong enough word when it comes to Jackson’s Godzilla fandom. You might be able to say he worships the king of the monsters. “Reporters constantly ask me to list my five heroes and Godzilla’s one of them,” he admitted. “So I’m loving it. I got to touch his skin the other day. It was a pretty big moment for me. That’s as close as I’ll ever get. So it’s been fun. Just having a ball on the biggest monster pay-per-view ever." While the original 1954 Godzilla indeed was a reaction to the atomic bombings of Japan during World War II, the new movies also have their own meaning in relation to the real world. The 2014 Godzilla reminded viewers of the Fukushima Daiichi nuclear disaster of 2011, for instance. King of the Monsters has a broader but still relevant subtext. That director himself also hinted at the significance of his take on this tradition for the franchise. “In a time when, in our current climate, where science is being constantly questioned and targeted, the idea of creating a film where scientists are heroes, I thought was really important,” Dougherty stated, calling back to his desire to put so much favorable focus on the scientist characters. Another part of the history and the tradition of the Godzilla movies is their crossover potential, which has been realized since almost the very beginning of the brand and Toho’s handling of it. Could that mean these creatures will again branch out and get their own solo movies again? Perhaps. But there are also other monsters worthy of reentering the Godzilla movies through this new MonsterVerse mega-franchise. Not that King of the Monsters doesn’t feature the cream of the crop. Then again, we already know of one other creature who’ll be meeting Godzilla very soon, specifically in next year’s sequel Godzilla vs. Kong. But where is King Kong during the events of King of the Monsters?